ST. MARY MACKILLOP was born on January 15, 1842 and died on August 8, 1909. She is also known as St. Mary of the Cross. She founded the Sisters of St. Joseph of the Sacred Heart with Father Julian Tenison Woods. They focus on education for the poor. She was canonized on October 17, 2010 by Pope Benedict XVI. (Image: SQPN.com) She is the first Australian Canonized Saint. 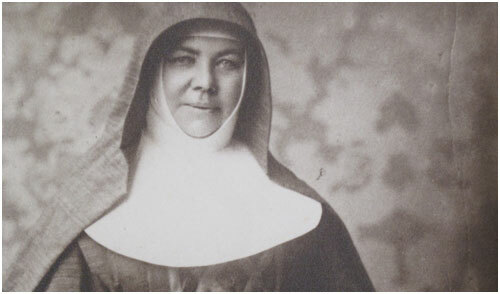 Mary Helen MacKillop was born in Fitzroy, Victoria. Her parents lived in Roybridge, Inverness-Shire, Scotland before their emigration to Australia. Her father was Alexander MacKillop and her mother was Flora MacDonald. They arrived in Melbourn in 1840. They had eight children: Margaret, 1843–1872, John 1845–1867, Annie 1848–1929, Alexandrina 1850–1882, Donald 1853–1925, Alick died at 11 months and Peter 1857–1878. Mary was the eldest. Her brother Donald became a Jesuit priest and her sister Alexandrina a nun. She was educated in private schools and became a teacher. She went to Penola, in 1866, with her sisters Annie and Lexie to open a Catholic school. Fr. Woods was made director of education and was the founder, along with MacKillop, of a school they opened in a stable. In 1867, MacKillop became Mother Superior of the new order Sisters of St Joseph of the Sacred Heart. (Image Cultural Catholic.com) They moved to the convent in Adelaide. Since then her order has grown and she is famous among Australians for her work.